This article is about the novel. For other uses, see The Da Vinci Code (disambiguation). The Da Vinci Code is a 2003 mystery thriller novel by Dan Brown. It follows "symbologist" Robert Langdon and cryptologist Sophie Neveu after a murder in the Louvre Museum in Paris causes them to become involved in a battle between the Priory of Sion and Opus Dei over the possibility of Jesus Christ having been a companion to Mary Magdalene. The title of the novel refers to the finding of the first murder victim in the Grand Gallery of the Louvre, naked and posed similar to Leonardo da Vinci's famous drawing, the Vitruvian Man, with a mathematical message written beside his body and a pentagram drawn on his chest in his own blood. The novel explores an alternative religious history, whose central plot point is that the Merovingian kings of France were descended from the bloodline of Jesus Christ and Mary Magdalene, ideas derived from Clive Prince's The Templar Revelation (1997) and books by Margaret Starbird. The book also refers to The Holy Blood and the Holy Grail (1982) though Dan Brown has stated that it was not used as research material. The Da Vinci Code provoked a popular interest in speculation concerning the Holy Grail legend and Mary Magdalene's role in the history of Christianity. The book has, however, been extensively denounced by many Christian denominations as an attack on the Roman Catholic Church, and consistently criticized for its historical and scientific inaccuracies. The novel nonetheless became a worldwide bestseller that sold 80 million copies as of 2009[update] and has been translated into 44 languages. Combining the detective, thriller and conspiracy fiction genres, it is Brown's second novel to include the character Robert Langdon: the first was his 2000 novel Angels & Demons. In November 2004, Random House published a Special Illustrated Edition with 160 illustrations. In 2006, a film adaptation was released by Columbia Pictures. Louvre Curator and Priory of Sion grand master Jacques Saunière is fatally shot one night at the museum by an albino Catholic monk named Silas, who is working on behalf of someone he knows only as the Teacher, who wishes to discover the location of the "keystone," an item crucial in the search for the Holy Grail. After Saunière's body is discovered in the pose of the Vitruvian Man, the police summon Harvard professor Robert Langdon, who is in town on business. Police captain Bezu Fache tells him that he was summoned to help the police decode the cryptic message Saunière left during the final minutes of his life. The message includes a Fibonacci sequence out of order. Langdon explains to Fache that Saunière was a leading authority on the subject of goddess artwork and that the pentacle Saunière drew on his chest in his own blood represents an allusion to the goddess and not devil worship, as Fache believes. Sophie Neveu, a police cryptographer, secretly explains to Langdon that she is Saunière's estranged granddaughter, and that Fache thinks Langdon is the murderer because the last line in her grandfather's message, which was meant for Neveu, said "P.S. Find Robert Langdon," which Fache had erased prior to Langdon's arrival. However, "P.S." actually refers to Sophie, as the nickname given to her by her grandfather is "Princess Sophie". It does not refer to PostScript. Neveu is troubled by memories of her grandfather's involvement in a secret pagan group. However, she understands that her grandfather intended Langdon to decipher the code, which leads them to a safe deposit box at the Paris branch of the Depository Bank of Zurich. Neveu and Langdon escape from the police and visit the bank. In the safe deposit box they find a box containing the keystone: a cryptex, a cylindrical, hand-held vault with five concentric, rotating dials labeled with letters. When these are lined up correctly, they unlock the device. If the cryptex is forced open, an enclosed vial of vinegar breaks and dissolves the message inside the cryptex, which was written on papyrus. The box containing the cryptex contains clues to its password. Langdon and Neveu take the keystone to the home of Langdon's friend, Sir Leigh Teabing, an expert on the Holy Grail, the legend of which is heavily connected to the Priory. There, Teabing explains that the Grail is not a cup, but a tomb containing the bones of Mary Magdalene. The trio then flees the country on Teabing's private plane, on which they conclude that the proper combination of letters spell out Neveu's given name, Sofia. Opening the cryptex, they discover a smaller cryptex inside it, along with another riddle that ultimately leads the group to the tomb of Isaac Newton in Westminster Abbey. During the flight to Britain, Neveu reveals the source of her estrangement from her grandfather ten years earlier. Arriving home unexpectedly from university, Neveu secretly witnesses a spring fertility rite conducted in the secret basement of her grandfather's country estate. From her hiding place, she is shocked to see her grandfather with a woman at the center of a ritual attended by men and women who are wearing masks and chanting praise to the goddess. She flees the house and breaks off all contact with Saunière. Langdon explains that what she witnessed was an ancient ceremony known as hieros gamos or "sacred marriage." By the time they arrive at Westminster Abbey, Teabing is revealed to be the Teacher for whom Silas is working. Teabing wishes to use the Holy Grail, which he believes is a series of documents establishing that Jesus Christ married Mary Magdalene and bore children, in order to ruin the Vatican. He compels Langdon at gunpoint to solve the second cryptex's password, which Langdon realizes is "apple." Langdon secretly opens the cryptex and removes its contents before tossing the empty cryptex in the air. Teabing is arrested by Fache, who by now realizes that Langdon is innocent. Bishop Aringarosa, head of religious sect Opus Dei and Silas' mentor, realizing that Silas has been used to murder innocent people, rushes to help the police find him. When the police find Silas hiding in an Opus Dei Center, he assumes that they are there to kill him and he rushes out, accidentally shooting Bishop Aringarosa. Bishop Aringarosa survives but is informed that Silas was found dead later from a gunshot wound. The final message inside the second keystone leads Neveu and Langdon to Rosslyn Chapel, whose docent turns out to be Neveu's long-lost brother, whom Neveu had been told died as a child in the car accident that killed her parents. The guardian of Rosslyn Chapel, Marie Chauvel Saint Clair, is Neveu's long-lost grandmother. It is revealed that Neveu and her brother are descendants of Jesus Christ and Mary Magdalene. The Priory of Sion hid her identity to protect her from possible threats to her life. The real meaning of the last message is that the Grail is buried beneath the small pyramid directly below the La Pyramide Inversée, the inverted glass pyramid of the Louvre. It also lies beneath the "Rose Line," an allusion to "Rosslyn." Langdon figures out this final piece to the puzzle; he follows the Rose Line to La Pyramide Inversée, where he kneels to pray before the hidden sarcophagus of Mary Magdalene, as the Templar knights did before him. The Da Vinci Code was a major success in 2003 and was outsold only by J. K. Rowling's Harry Potter and the Order of the Phoenix. A woman protesting against The Da Vinci Code film outside a movie theater in Culver City, California. The TFP acronym in the banner stands for the American Society for the Defense of Tradition, Family and Property. The most flagrant aspect... is not that Dan Brown disagrees with Christianity but that he utterly warps it in order to disagree with it... to the point of completely rewriting a vast number of historical events. And making the matter worse has been Brown's willingness to pass off his distortions as ‘facts' with which innumerable scholars and historians agree. The book opens with the claim by Dan Brown that "The Priory of Sion—a French secret society founded in 1099—is a real organization". This assertion is broadly disputed; the Priory of Sion is generally regarded as a hoax created in 1956 by Pierre Plantard. The author also claims that "all descriptions of artwork, architecture, documents… and secret rituals in this novel are accurate", but this claim is disputed by numerous academic scholars expert in numerous areas. In 2003, while promoting the novel, Brown was asked in interviews what parts of the history in his novel actually happened. He replied "Absolutely all of it." In a 2003 interview with CNN's Martin Savidge he was again asked how much of the historical background was true. He replied, "99% is true… the background is all true". Asked by Elizabeth Vargas in an ABC News special if the book would have been different if he had written it as non-fiction he replied, "I don't think it would have." In 2005, UK TV personality Tony Robinson edited and narrated a detailed rebuttal of the main arguments of Dan Brown and those of Michael Baigent, Richard Leigh and Henry Lincoln, who authored the book Holy Blood, Holy Grail, in the program The Real Da Vinci Code, shown on British TV Channel 4. The program featured lengthy interviews with many of the main protagonists cited by Brown as "absolute fact" in The Da Vinci Code. Arnaud de Sède, son of Gérard de Sède, stated categorically that his father and Plantard had made up the existence of the Prieuré de Sion, the cornerstone of the Jesus bloodline theory: "frankly, it was piffle", noting that the concept of a descendant of Jesus was also an element of the 1999 Kevin Smith film, Dogma. The earliest appearance of this theory is due to the 13th-century Cistercian monk and chronicler Peter of Vaux de Cernay who reported that Cathars believed that the 'evil' and 'earthly' Jesus Christ had a relationship with Mary Magdalene, described as his concubine (and that the 'good Christ' was incorporeal and existed spiritually in the body of Paul). The program The Real Da Vinci Code also cast doubt on the Rosslyn Chapel association with the Grail and on other related stories, such as the alleged landing of Mary Magdalene in France. According to The Da Vinci Code, the Roman Emperor Constantine I suppressed Gnosticism because it portrayed Jesus as purely human. The novel's argument is as follows: Constantine wanted Christianity to act as a unifying religion for the Roman Empire. He thought Christianity would appeal to pagans only if it featured a demigod similar to pagan heroes. According to the Gnostic Gospels, Jesus was merely a human prophet, not a demigod. Therefore, to change Jesus' image, Constantine destroyed the Gnostic Gospels and promoted the gospels of Matthew, Mark, Luke, and John, which portray Jesus as divine or semi-divine. But Gnosticism did not portray Jesus as merely human. All Gnostic writings depict Christ as purely divine, his human body being a mere illusion (see Docetism). Gnostic sects saw Christ this way because they regarded matter as evil, and therefore believed that a divine spirit would never have taken on a material body. Janet Maslin of The New York Times said that one word "concisely conveys the kind of extreme enthusiasm with which this riddle-filled, code-breaking, exhilaratingly brainy thriller can be recommended. That word is wow. The author is Dan Brown (a name you will want to remember). In this gleefully erudite suspense novel, Mr. Brown takes the format he has been developing through three earlier novels and fine-tunes it to blockbuster perfection." David Lazarus of The San Francisco Chronicle said, "This story has so many twists—all satisfying, most unexpected—that it would be a sin to reveal too much of the plot in advance. Let's just say that if this novel doesn't get your pulse racing, you need to check your meds." While interviewing Umberto Eco in a 2008 issue of The Paris Review, Lila Azam Zanganeh characterized The Da Vinci Code as "a bizarre little offshoot" of Eco's novel, Foucault’s Pendulum. In response, Eco remarked, "Dan Brown is a character from Foucault's Pendulum! I invented him. He shares my characters' fascinations—the world conspiracy of Rosicrucians, Masons, and Jesuits. The role of the Knights Templar. The hermetic secret. The principle that everything is connected. I suspect Dan Brown might not even exist." Salman Rushdie said during a lecture, "Do not start me on The Da Vinci Code. A novel so bad that it gives bad novels a bad name." Stephen Fry has referred to Brown's writings as "complete loose stool-water" and "arse gravy of the worst kind". In a live chat on June 14, 2006, he clarified, "I just loathe all those book[s] about the Holy Grail and Masons and Catholic conspiracies and all that botty-dribble. I mean, there's so much more that's interesting and exciting in art and in history. It plays to the worst and laziest in humanity, the desire to think the worst of the past and the desire to feel superior to it in some fatuous way." Stephen King likened Dan Brown's work to "Jokes for the John", calling such literature the "intellectual equivalent of Kraft Macaroni and Cheese". The New York Times, while reviewing the movie based on the book, called the book "Dan Brown's best-selling primer on how not to write an English sentence". The New Yorker reviewer Anthony Lane refers to it as "unmitigated junk" and decries "the crumbling coarseness of the style". Linguist Geoffrey Pullum and others posted several entries critical of Dan Brown's writing, at Language Log, calling Brown one of the "worst prose stylists in the history of literature" and saying Brown's "writing is not just bad; it is staggeringly, clumsily, thoughtlessly, almost ingeniously bad". Roger Ebert described it as a "potboiler written with little grace and style", although he said it did "supply an intriguing plot". In his review of the film National Treasure, whose plot also involves ancient conspiracies and treasure hunts, he wrote: "I should read a potboiler like The Da Vinci Code every once in a while, just to remind myself that life is too short to read books like The Da Vinci Code." In early 2006, Michael Baigent and Richard Leigh filed suit against Brown's publishers, Random House. They alleged that significant portions of The Da Vinci Code were plagiarized from Holy Blood, Holy Grail, violating their copyright. Brown confirmed during the court case that he named the principal Grail expert of his story Leigh Teabing, an anagram of "Baigent Leigh", after the two plaintiffs. In reply to the suggestion that Henry Lincoln was also referred to in the book, since he has medical problems resulting in a severe limp, like the character of Leigh Teabing, Brown stated he was unaware of Lincoln's illness and the correspondence was a coincidence. Since Baigent and Leigh had presented their conclusions as historical research, not as fiction, Mr Justice Peter Smith, who presided over the trial, deemed that a novelist must be free to use these ideas in a fictional context, and ruled against Baigent and Leigh. Smith also hid his own secret code in his written judgement, in the form of seemingly random italicized letters in the 71-page document, which apparently spell out a message. Smith indicated he would confirm the code if someone broke it. After losing before the High Court on July 12, 2006, they then appealed, unsuccessfully, to the Court of Appeal. In April 2006 Mikhail Anikin, a Russian scientist and art historian working as a senior researcher at the Hermitage Museum in St Petersburg, stated the intention to bring a lawsuit against Dan Brown, maintaining that he was the one who coined the phrase used as the book's title and one of the ideas regarding the Mona Lisa used in its plot. Anikin interprets the Mona Lisa to be a Christian allegory consisting of two images, one of Jesus Christ that comprises the image's right half, one of the Virgin Mary that forms its left half. According to Anikin, he expressed this idea to a group of experts from the Museum of Houston during a 1988 René Magritte exhibit at the Hermitage, and when one of the Americans requested permission to pass it along to a friend Anikin granted the request on condition that he be credited in any book using his interpretation. Anikin eventually compiled his research into Leonardo da Vinci or Theology on Canvas, a book published in 2000, but The Da Vinci Code, published three years later, makes no mention of Anikin and instead asserts that the idea in question is a "well-known opinion of a number of scientists." The 2006 BBC program Dead Ringers parodied The Da Vinci Code, calling it the "Da Rolf Harris Code". The book was parodied in the Mad episode "Da Grinchy Code / Duck", in which the greatest movie minds try to solve the mystery of the Grinch. The book's theme of conspiracy theories is parodied in the 2007 MC Solaar single "Da Vinci Claude". The Da Vinci Code (1st ed. ), US: Doubleday, April 2003, ISBN 0-385-50420-9 . The Da Vinci Code (spec illustr ed. ), Doubleday, November 2, 2004, ISBN 0-385-51375-5 (as of January 2006, has sold 576,000 copies). The Da Vinci Code, UK: Corgi Adult, April 2004, ISBN 0-552-14951-9 . The Da Vinci Code (illustr ed. ), UK: Bantam, October 2, 2004, ISBN 0-593-05425-3 . The Da Vinci Code (trade paperback), US/CA: Anchor, March 2006 . The da Vinci code (paperback), Anchor, March 28, 2006 , 5 million copies. The da Vinci code (paperback) (special illustrated ed. ), Broadway, March 28, 2006 , released 200,000 copies. Goldsman, Akiva (May 19, 2006), The Da Vinci Code Illustrated Screenplay: Behind the Scenes of the Major Motion Picture, Howard, Ron; Brown, Dan introd, Doubleday, Broadway , the day of the film's release. Including film stills, behind-the-scenes photos and the full script. 25,000 copies of the hardcover, and 200,000 of the paperback version. Columbia Pictures adapted the novel to film, with a screenplay written by Akiva Goldsman, and Academy Award winner Ron Howard directing. The film was released on May 19, 2006, and stars Tom Hanks as Robert Langdon, Audrey Tautou as Sophie Neveu, and Sir Ian McKellen as Sir Leigh Teabing. During its opening weekend, moviegoers spent an estimated $77 million in America, and $224 million worldwide. The movie received mixed reviews. Roger Ebert in its review wrote that "Ron Howard is a better filmmaker than Dan Brown is a novelist; he follows Brown's formula (exotic location, startling revelation, desperate chase scene, repeat as needed) and elevates it into a superior entertainment, with Tom Hanks as a theo-intellectual Indiana Jones." "it's involving, intriguing and constantly seems on the edge of startling revelations." The film received two sequels: Angels & Demons, released in 2009, and Inferno, released in 2016. Ron Howard returned to direct both sequels. ^ Wyat, Edward (November 4, 2005). "'Da Vinci Code' Losing Best-Seller Status" Archived October 12, 2013, at the Wayback Machine. The New York Times. ^ "New novel from Dan Brown due this fall". San Jose Mercury News. Archived from the original on June 4, 2011. Retrieved January 4, 2011. ^ Minzesheimer, Bob (December 11, 2003). "'Code' deciphers interest in religious history". USA Today. Archived from the original on January 10, 2010. Retrieved May 25, 2010. ^ a b Ford, Marcia. "Da Vinci Debunkers: Spawns of Dan Brown's Bestseller". FaithfulReader. Archived from the original on May 27, 2004. Retrieved April 29, 2015. ^ "History vs The Da Vinci Code". Retrieved February 3, 2009. ^ Kelleher, Ken; Kelleher, Carolyn (April 24, 2006). "The Da Vinci Code" (FAQs). Dan Brown. Archived from the original on March 25, 2008. Retrieved February 3, 2009. ^ "Fiction". History vs The Da Vinci Code. Retrieved February 3, 2009. ^ Sibly, WA; Sibly, MD (1998), The History of the Albigensian Crusade: Peter of les Vaux-de-Cernay's "Historia Albigensis", Boydell, ISBN 0-85115-658-4, Further, in their secret meetings they said that the Christ who was born in the earthly and visible Bethlehem and crucified at Jerusalem was 'evil', and that Mary Magdalene was his concubine – and that she was the woman taken in adultery who is referred to in the Scriptures; the 'good' Christ, they said, neither ate nor drank nor assumed the true flesh and was never in this world, except spiritually in the body of Paul. I have used the term 'the earthly and visible Bethlehem' because the heretics believed there is a different and invisible earth in which – according to some of them – the 'good' Christ was born and crucified. ^ O'Neill, Tim (2006), "55. Early Christianity and Political Power", History versus the Da Vinci Code, archived from the original on May 15, 2009, retrieved February 16, 2009 . ^ a b O'Neill, Tim (2006), "55. Nag Hammadi and the Dead Sea Scrolls", History versus the Da Vinci Code, archived from the original on May 15, 2009, retrieved February 16, 2009 . ^ Arendzen, John Peter (1913), "Docetae", Catholic Encyclopedia, 5, New York: Robert Appleton, The idea of the unreality of Christ's human nature was held by the oldest Gnostic sects [...] Docetism, as far as at present known, [was] always an accompaniment of Gnosticism or later of Manichaeism. ^ a b Lane, Anthony (May 29, 2006). "Heaven Can Wait" Archived October 12, 2013, at the Wayback Machine. The New Yorker. ^ Miller, Laura (December 29, 2004). "The Da Vinci crock" Archived September 18, 2011, at the Wayback Machine. Salon.com. Retrieved 2009-05-15. ^ Steyn, Mark (May 10, 2006) "The Da Vinci Code: bad writing for Biblical illiterates" Archived June 11, 2013, at the Wayback Machine. Maclean's. ^ Maslin, Janet (March 17, 2003). "Spinning a Thriller From a Gallery at the Louvre" Archived April 8, 2016, at the Wayback Machine. ^ Lazarus, David (April 6, 2003). "'Da Vinci Code' a heart-racing thriller". San Francisco Chronicle. ^ Zanganeh, Lila Azam. "Umberto Eco, The Art of Fiction No. 197" Archived October 6, 2016, at the Wayback Machine. The Paris Review. Summer 2008, Number 185. Retrieved 2012-04-27. ^ Yeoman, William (June 30, 2010), "Vampires trump wizards as readers pick their best" (PDF), The West Australian, archived from the original (PDF) on August 4, 2011, retrieved March 24, 2011 . ^ "Famed author takes on Kansas". LJWorld. October 7, 2005. Archived from the original on August 30, 2009. Retrieved January 4, 2011. ^ "3x12", QI (episode transcript) . ^ "Interview with Douglas Adams Continuum". SE: Douglas Adams. Archived from the original on May 19, 2011. Retrieved January 4, 2011. ^ "Stephen King address, University of Maine". Archive. Archived from the original on October 13, 2007. Retrieved January 4, 2011. ^ Sorkin, Aaron (December 30, 2010). "Movie Review: The Da Vinci Code (2006)". The New York Times. Retrieved January 4, 2011. ^ a b Ebert, Roger. "Roger Ebert's review". Sun times. Archived from the original on October 10, 2012. Retrieved January 4, 2011. ^ "Judge creates own Da Vinci code". BBC News. April 27, 2006. Archived from the original on September 5, 2007. Retrieved September 13, 2009. ^ a b "Authors who lost 'Da Vinci Code' copying case to mount legal appeal". Retrieved July 12, 2006. ^ "Judge rejects claims in 'Da Vinci' suit". MSNBC. MSN. April 7, 2006. Archived from the original on July 6, 2006. Retrieved February 3, 2009. 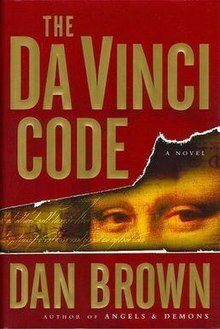 ^ Grachev, Guerman (April 13, 2006), "Russian scientist to sue best-selling author Dan Brown over 'Da Vinci Code' plagiarism", Pravda, RU, archived from the original on October 7, 2012, retrieved May 13, 2011 . ^ "World editions of The Da Vinci Code", Secrets (official site), Dan Brown, archived from the original on January 27, 2006 . ^ "Harry Potter still magic for book sales", Arts, CBC, January 9, 2006, archived from the original on October 13, 2007 . ^ "The Da Vinci Code (2006)". Box Office Mojo. Archived from the original on May 13, 2013. Retrieved December 16, 2006. Pullum, Geoffrey K. "The Dan Brown code." This page was last edited on 22 April 2019, at 03:35 (UTC).